The (10-1) New Orleans Saints will be seeking their 11th straight victory this Thursday night when they travel to AT&T Stadium in Arlington, Texas to face their long-time rivals from the NFC, the Dallas Cowboys. Kickoff is at 7:20 P.M. Central time and will be broadcast nationally by FOX Sports. The Cowboys lead the NFC East Division currently with a (6-5) win-loss record, and though they’ve struggled notably at different times this year, they’ve since managed to win their last three games and still have one of the more dangerous and competitive teams in the entire NFL; led by 3rd-year veteran quarterback Dak Prescott, All-Pro running back sensation Ezekiel Elliot, and emerging 3rd year superstar wide receiver Amari Cooper. Nevertheless: the Saints are still heavily favored (by 7 points as of this writing) as a road team, to win this highly-anticipated contest. The last time that New Orleans and Dallas faced each other was three years ago, in Week #4 of the 2015 NFL season. 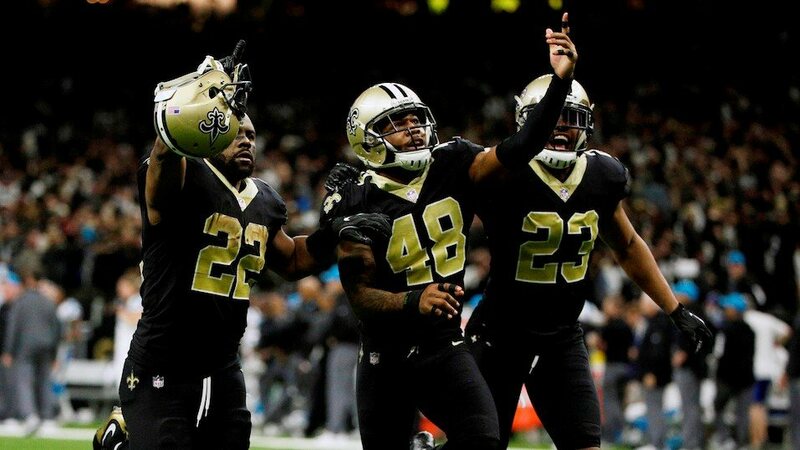 During that game, the Saints came from behind to win in overtime by a score of 26-20; when former Saints running back C.J. Spiller out-ran the entire Cowboys defense for an 80-yard game-winning touchdown down the right sideline. The play was not only the winning score but at that time was also quarterback Drew Brees’ 400th career touchdown pass. 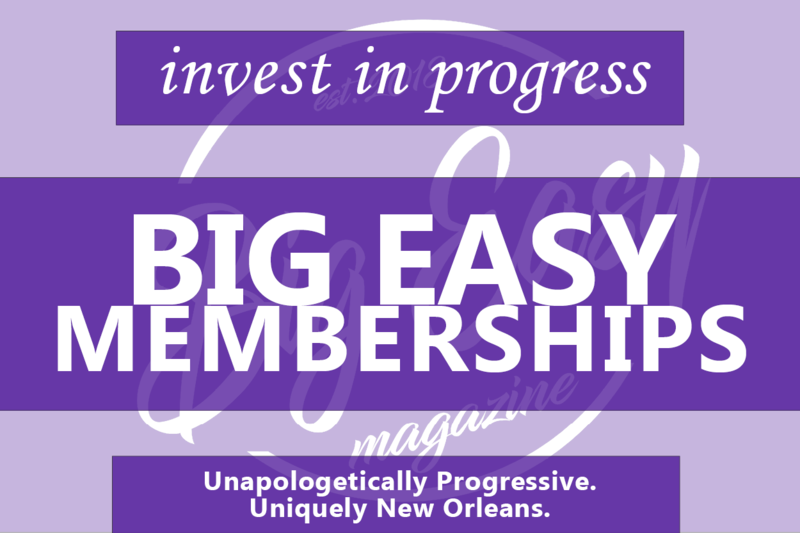 And so it’s with all of that in mind this morning, that Big Easy Magazine presents 5 Bold Predictions for this Thursday night’s contest as the New Orleans Saints attempt to win their 11th straight game, on the road at AT&T Stadium against their NFC rivals, the Dallas Cowboys. Without any doubt, THE #1 reason behind the Cowboys’ sudden re-emergence back into the NFC playoff chase has been the acquisition of 3rd year veteran and former University of Alabama All-American WR Amari Cooper; whom they received in a trade with the Oakland Raiders last month in exchange for their top pick in next year’s 2019 NFL Draft. Dallas was a paltry (3-4) before trading for Cooper, but they’ve gone (3-1) ever since his arrival. Essentially, he’s been the catalyst for a team that seemed destined for a losing season this year. In 4 games as a Cowboy, Cooper has caught 22 passes for 349 yards and three touchdowns. Essentially, Cooper’s presence gives them the “true” #1 WR they didn’t have before the trade; as evidenced by the fact that his 349 receiving yards now ranks him 3rd on the Dallas roster in receiving yardage; and his three touchdown catches already rank him (remarkably) as the Cowboys team leader in that category. Saints 2nd year CB Marshon Lattimore is the one player who most likely will draw the assignment of covering Cooper in Thursday Night’s contest, and he’ll have a “mixed bag” while doing so; with 2 PBU’s (pass break-ups) and an interception but not before he yields 96 total receiving yards and a touchdown to Cooper in the process. Obviously, it’s been a great season for the Saints offense this year; and undoubtedly 2nd year RB Alvin Kamara has played a big part in that rather notable success. 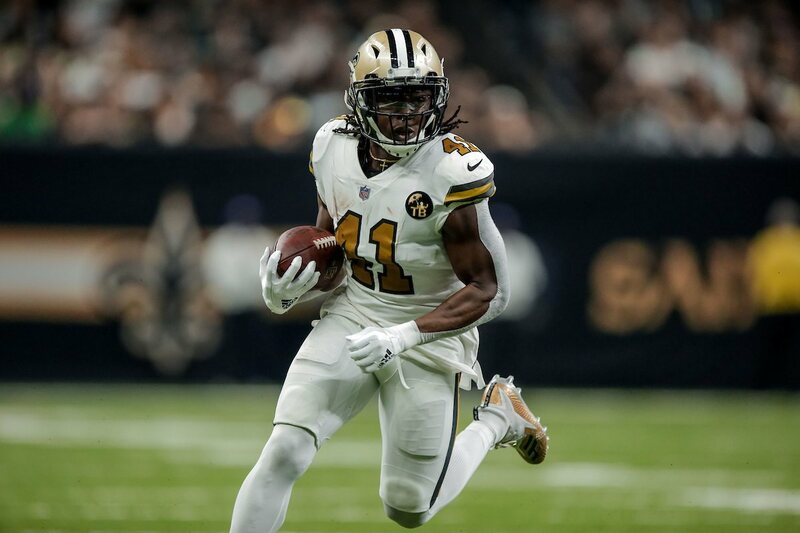 Through 11 games played, Kamara has carried the ball 150 times for 706 yards (a 4.7-yard average) and 11 rushing touchdowns, However, he continually fills a huge role as a receiver out of the backfield; and has caught 57 passes for another additional 519 yards and four touchdowns. That’s a total of 1225 total yards from scrimmage and 15 touchdowns scored, for those of you keeping track at home. Kamara will continue in that role in this contest against a Cowboys defense that’s currently ranked 8th overall (331.1 yards per game) in the NFL in yards allowed; and is yielding (19.4) points per game, which is good for the 4th ranked defense overall in points allowed. In this upcoming contest on Thursday night, Kamara will post some decent numbers offensively, with 12 carries for 56 yards and another 52 yards receiving on four catches for a grand total of 108 yards from scrimmage. However, his biggest impact will come on the scoreboard — as he scores two touchdowns on the ground and another via the airwaves from Drew Brees, for a total of three touchdowns (a.k.a., the “hat trick”) as New Orleans continues its incredible offensive output. While Alvin Kamara certainly has filled a vital role for the Saints offense, his counterpart on the opposite sidelines — 3rd year Cowboys All-Pro RB Ezekiel Elliot — has virtually been unstoppable in his own right. With the notable exception of Los Angeles Rams RB Todd Gurley, Elliot will probably be the toughest RB that the Saints will face all season. 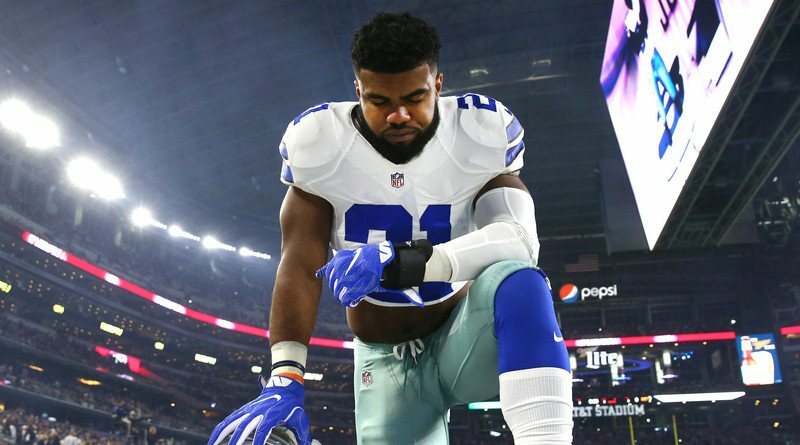 Elliott leads the NFL in rushing yards (1,074) and has been wreaking absolute havoc on opposing defenses during Dallas’ current three-game win streak. In his last three games, Elliot has racked up over 400 yards running the ball, while averaging close to six yards per carry. But much like Kamara, his bigger impact might be in the receiving game, where he has caught a total of 18 passes for 137 yards in the past three contests (all Dallas wins). Altogether, Elliott is averaging 177 yards from scrimmage during the Cowboys’ current three-game winning streak. However, the Saints still have the #1 rated run defense in the entire NFL for a majority of this season, and both Elliot and the Cowboys rushing attack will face a rather stiff challenge in this contest to be sure. The New Orleans run defense will “stuff” Elliot for the most part, limiting to him 87 rushing yards on 19 carries; but not before he makes a sensational play for a touchdown after breaking two tackle attempts by the Saints linebacking corps on a 56-yard screen pass. 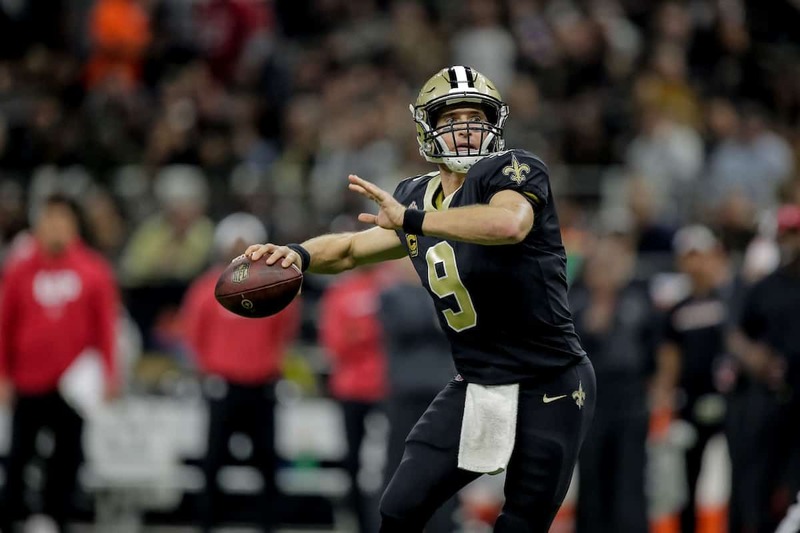 Saints QB Drew Brees seemingly has solidified his hold on the League MVP award this year, after having what might be the greatest year of his entire 18-year NFL career up to this point. He leads all NFL quarterbacks with a career-high 127.3 rating and has also thrown 29 touchdown passes and two interceptions — the best TD-to-interception ratio (by far and away) of any QB in the League. 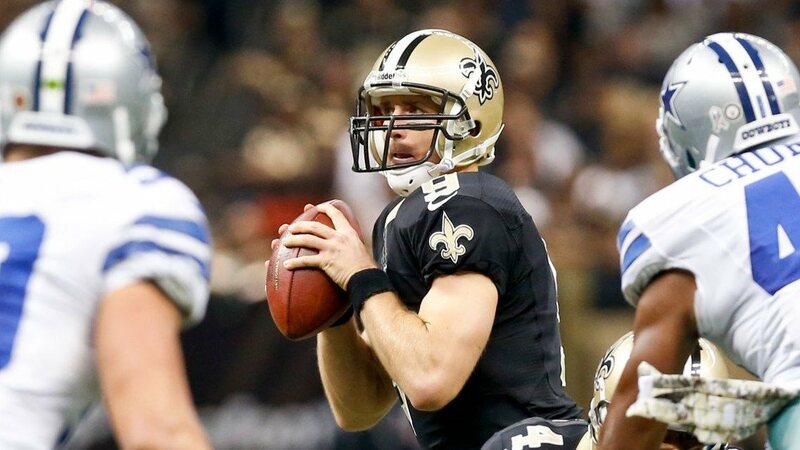 In fact, Brees has essentially “owned” Dallas during his time wearing the Black and Gold. He has completed 71.1 percent of his passes for 2,571 yards (367.3 yards per game), along with 18 touchdown passes but has only thrown for three interceptions, which additionally is good enough for a 112.7 passer rating. But make no mistake about it; it’s the Saints top-rated O-Line that has been the “fuel for the fire” so to speak. The unit as a whole is only allowing 0.91 sacks per contest (slightly less than one per game). In all, the Saints O-Line has only given up (10) sacks in 11 games; an absolutely remarkable statistic. In this contest, those numbers will come into play particularly against 5th-year Cowboys defensive end Demarcus Lawrence, who had Saints fans up in arms yesterday over his pointed comments directed at this very same Saints O-Line. But the Saints get the last laugh in this instance, as 2nd-year Saints right tackle Ryan Ramczyk keeps the trash-talking pass-rusher at bay; limiting him to one QB pressure on the night. All of it will add up to yet another masterful performance by Brees and the Saints passing game; which will account for the ageless wonder and soon-to-be 40-year old’s stat-line in this contest of 22-for-28 passing and 376 passing yards and two passing TD’s and zero interceptions, while further strengthening his hold on his first-ever League MVP award. … an interception by Saints safety Vonn Bell, the 2nd interception of the night thrown by Cowboys 3rd-year QB Dak Prescott, gives the Saints great field position at their own 48-yard line and leading by a score of 24-17. After picking up two first downs on the following series of downs, the drive stalls and New Orleans is forced to settle for a 52-yard Wil Lutz field goal, extending the lead to 27-17 with less than 10 minutes remaining left in regulation. On the very next Dallas possession, Elliot’s 22-yard run and a 17-yard reception by Cooper quickly put the Cowboys into Saints territory; and the Cowpokes pull to within a score of 27-24 after Prescott breaks not one, not two, but THREE tackle attempts by Saints defenders as he scrambles out of the pocket, before hitting WR Michael Gallup with a 43-yard TD pass. The Saints then answer back with a methodical, 11-play 78-yard drive that culminates with a 1-yard TD plunge by FB Zach Line; to put New Orleans ahead by a score of 34-24 with a little over five minutes remaining on the game clock. Not to be outdone, however, the Cowboys answer right back with another quick TD, this time on a wild 75-yard TD catch by WR Cole Beasley, who outraces Saints slot CB PJ Williams step-for-step down the Cowboys sideline to pull Dallas within a score of 37-34 as the clock ticks down under 4 minutes remaining. From there, the unthinkable happens — but to BOTH TEAMS. The Saints essentially only need to get a first down to run out the clock and escape with the narrow victory, but on 3rd down Brees’ pass completion to Josh Hill is fumbled after the 6th-year tight end is nearly decapitated on a hit by Cowboys rookie linebacker Leighton Vander Esch. Dallas now has the ball back on a critical turnover committed by the Saints offense with a chance to tie the game and send it into overtime with a field goal, or the opportunity to win the game outright with a touchdown. But the Saints defense stiffens and holds Dallas to only one first down of their own; and following a Prescott incompletion to Cooper, the Cowboys are faced with a decision: either go for it on 4th down and try to win the game outright for the upset; or simply kick the game-tying field goal to send it into overtime. Cowboys head coach Jason Garrett ultimately decides to settle for the field goal and out trots kicker Brett Maher; who had been solid for the most part this season but has also missed a kick in each of the last four games. Brett Maher has missed at least one kick of some kind in four straight games. Three of those have been decided by one possession. Nevertheless, Maher needs only to hit the kick from 51 yards out, easily within his range. As the ball is snapped, Maher makes contact with the ball cleanly and it appears that it has the distance to make it through the uprights. Sounds intense, but not too accurate. We have a better than average defense. Hey Barry, this drama reads a lot like your Ravens storyline. 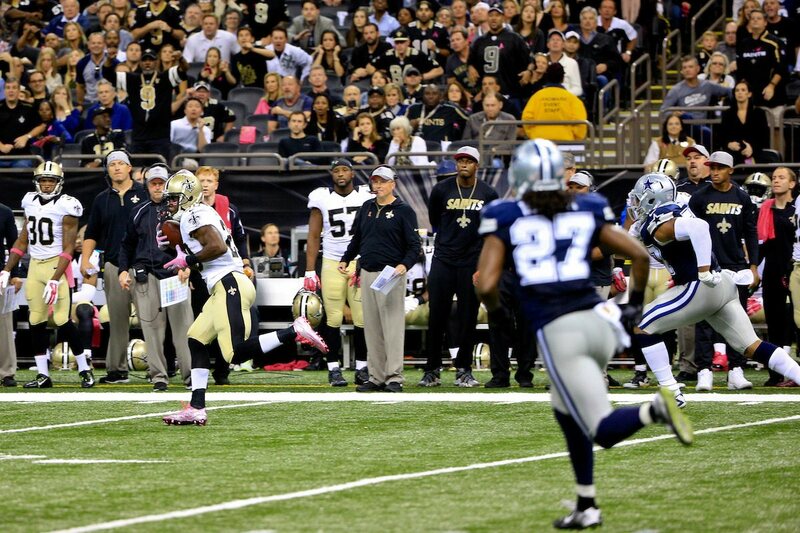 Here goes my take…..Saints Defense will hold Cowboys under 300 yards on Offense. Two INTs..(Demario Davis and Marcus Wms), 4 sacks (Davenport, Cam Jordon, Rankins and Klein), and fumble by Prescott recovery caused by PJ and recovered by Bell. Offense…Brees tosses 4 touchdowns…Mike Thomas (2), Kamara (1) and Marshall (1). Ingram rushes for 93 yards while Kamara adds 63. Taysom Hill hits Watson for a 9 yard td. Two field goals by Lutz. Saints roll. 41-24.